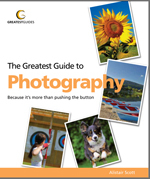 Alistair’s book ‘Photography’ is one of the titles in the Greatest Guide series. This fully-illustrated, 192-page book is a straightforward guide to using your camera effectively. It is packed with non-technical advice that will help you take better photographs and profit from them. Though written with a humorous tone, it gives serious guidance on everything from buying your equipment, through using the camera’s exposure controls, to techniques for portrait, landscape and family photography. There is even a chapter on earning cash from your camera. And, make your hobby pay for itself. You’ll find Alistair’s Greatest Guide to Photography a source of information and inspiration – as valuable as a third eye. Available from Amazon UK (where you can browse through the first few chapters) and from all good bookshops.